Excellent photo report in slideshow form from Doctor Faust's Painting Clinic YouTube Channel. The event covered is 2007 2007 Southern California Area Historical Miniatures Society California Show. If you enjoy his video, do consider subscribing to his YouTube Channel. The 1/72 scale Dragon Armor series is hugely popular, and the vast range of armored vehicles on offer is incredibly detailed. Indeed, it’s hard to imagine how Dragon could improve upon them! Well, it has…perhaps not in terms of the vehicles themselves, but in their presentation. Dragon is pleased to launch its PanorArmor series, which features colored backgrounds fitted inside the display boxes. The dioramic card background carefully matches the vehicle contained inside, whether it be a dramatic North Africa battle, the steppes in the height of summer, or a village in the eastern front. These scenic illustrations are masterfully painted and they perfectly set off Dragon’s already excellent vehicles. For collectors, the PanorArmor series is the ideal way to show off their collections and display their vehicles in authentic settings! Source: Dragon Model USA Newsletter. 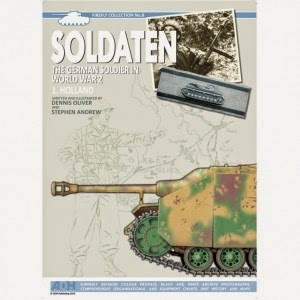 The book Soldaten: The German Soldier In World War II Holland is published by Oliver Publishing and ADH. It covers the German army in World War II around the allied invasion of Holland between September 1944 to May 1945. There are 13 full color pages with 5 plates of uniform and insignia plus illustrations for 24 armoured vehicles. Black and white photos, maps, orders of battle and background history are also present. It is the 8th book in the Firefly book collection. It is available at your nearest hobby shop, you can check a comprehensive list from The Modelling News or get them from Dragon Models USA, as well as ADH Publishing in the UK. Plastic Scale Model is a participant in the Amazon Services LLC Associates Program, an affiliate advertising program designed to provide a means for sites to earn advertising fees by advertising and linking to amazon.com. © 2012-2013 FireSnakeR. Simple theme. Powered by Blogger.